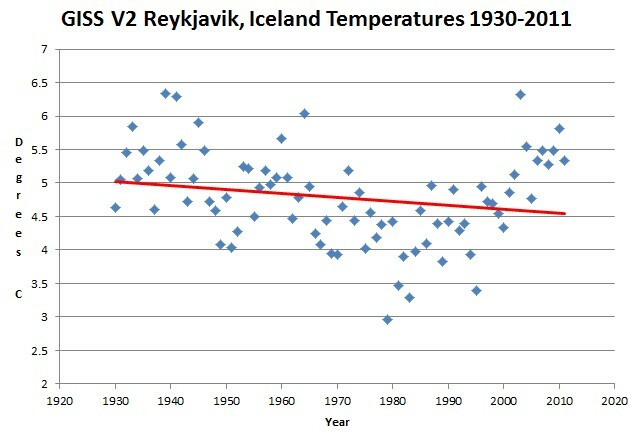 The two graphs below show what temperatures used to look like in the US and Iceland, before they were tampered with at GISS. The 1930s was the hottest decade, and temperatures were declining. This disproved Hansen’s theories, so he had to get rid of the graphs. The blink comparators below show how Hansen got rid of those unwanted cooling trends. Our lukewarm friends say that GISS data is all good, which means that the Earth is both warming and cooling at the same time. I hope an explanation by GISS for the “adjustments” will be forthcoming, as it is surely warranted! They have their excuses which are published along with the massaged data. Read it only if you want your head to hurt worse than it does looking at these graphs. Idiot adjustments made by a man that utterly debases NASA and all it stands for. Hansen is no less corrupting than your worst Mafia boss. Whatever it takes to agree with the AGW agenda; Hansen will do it. Are you people serious? Why dont you check out the study that the Koch Brothers funded? They wanted this Berkley scientist to agree with you…they PAID him to disprove climate change….and he returned with a report that said the EARTH IS DEFINATELY WARMING. Hansen is not the only scientist telling the truth….Like 99% of the climate scientists and geologists on the PLANET say the planet is warming. The other 1% work for Big Oil and say what they are PAID to say. Give it up. You’re hurting everyone with this disinformation. I have presented a simple and straightforward analysis of data from the GISS website. Do you have any comment about the data, or are you only interested in gossip? I really have no idea who the Koch brothers are, and Muller made no attempt to evaluate if the data had been altered – which is the topic of this post. Everyone agrees that the altered data shows warming, so what is your point? @John: You warmists are so predictable. Anything that contradicts AGW must be funded by the Koch brothers or Big Oil who are evil, thereby making that reserach wrong. Never mind facts, just guilt by association. By the way, if you think Hansen is telling the truth, keep this in mind – he is an anti-coal activist. Do you really think he is going to be objective in his science when he injects so much activist politics into it? psst… the point is that the earth is NOT WARMING….NO increase as forecast by the hallowed IPCC models, or as shrieked in Algore and Hansen’s outrageous claims. As I have written in 40+ online articles and blogs about that very accusation…… two words: Prove it. Fail to do so, and potentially the entire idea of AGW blows up. Thanks for the clear demonstration of the warmists’ command of logic and the English language… when you can’t argue the facts, attack your opponent… Saul Alinsky would be proud! Wow! You guys must be the only ones left holding onto the truth about global warming. Don’t be discouraged by the alarming temperature spikes all around the world or the extreme weathure events. Keep playing those violins. Yes, bad weather never happened before. Uhmm… lol around the world……. numbnuts, this year has been cooler than most of the recent years. “2. Muller is actually working hand in glove with SHELL OIL. Richard Muller is President and Chief Scientist of Muller & Associates. BTW, a privately held company is an excellent way to hide BRIBES AS CONSULTING FEES! If you then go to the listing of the TEAM at Muller Assoc. you find. Arthur Rosenfeld, Former California Energy Commissioner among others. And guess what ? We find SHELL OIL! We also find Muller & Associates is pushing ‘Sustainability” aka Agenda 21. GreenGov™ is a service offered by Muller & Associates for Governments, International Organizations, non profits, and other organizations that work with Government…. So, WHY is the SHELL OIL connection important? If we follow the Shell Oil connection, we find Queen Beatrix of the Dutch House of Orange and Lord Victor Rothschild are the two largest shareholders of RD/Shell. (I read some where the Dutch Royal family owns about 25%) The British Royals also own a healthy chunk of Shell. Prince Bernhard of the Dutch Royal Family is heavily tied to the World Wildlife Fund (WWF) as is Prince Philip, who was the first President of World Wildlife Fund. Not to mention John H. Loudon, Better known as “the Grand Old Man of Shell” John H. Loudon, a Dutchman, headed Royal Dutch Shell from 1951 to 1965 and he was President of WWF from 1976 to 1981. David Hone is not only SHELL OIL’S Senior Climate Change Adviser he is also Chairman of the International Emissions Trading Association. He and his mentor James Smith. SHELL OIL’S previous UK Chairman took SHELL very deeply into Carbon Trading. Gets positively incestuous doesn’t it? • Although there has been 13.77 billion years since the Big Bang produced the initial protons, the universe is still primarily hydrogen atoms, all which were created at that moment. • We have traced our Solar system and found it to be in the Local Interstellar Cloud of the Local Spur of the Orion Arm in our galaxy. This is on the outer edge of our galaxy about 8.33 kpc (27,000 light years) from our black hole galaxy center. • The Moon most likely was created by collision of Earth with a Giant Impact Object that was accreted, we estimate in near-Earth orbit, within about 30 M km of our orbit with the Sun. Here we estimate that it took about 18 million years, from mutual gravitational attraction, for the collision to occur. It most likely was a near head-on collision (since their relative orbital velocities were very small) with a fast-spinning Earth based on Gott (2011) and Cuk and Stewart (2012), with the Moon being primarily Earth composition and Earth isotopic signature. • Even during our present Holocene intergalactic warm period, the past Interglacial Periods minimal correlation between CO2 and Temperature indicate that at least 90% of our climate is dominated by extraterrestrial forces. Airborne CO2 concentrations have little temperature (and thus climate) effect. ● The closure of the Atrato Seaway in Panama, the positioning of Antarctica at the South Pole and the enclosure of the Arctic Ocean by Alaska, Canada, Greenland, Northern Europe and Russia has created a North Atlantic Thermohaline flow pattern, warming North America and Europe, but a unique condition in the history of Earth, where Earth has become very fragile to small changes in Solar energy transfer to its surface. ● The large variation in Global Surface Air Temperature during the glacial-to Interglacial-back to-glacial cycles is driven by extraterrestrial forces, which could be astronomical forces related to variations in the celestial mechanical properties of it rotation around the Sun such as eccentricity, obliquity and elliptical precession (Milankovitch cycles). ● Major climate fluctuations, far exceeding other Earth-bound perturbations from other sources, has occurred from the sudden release of cold water from Northern Hemisphere Glacial Lakes during Ice Sheet melting for Interglacial cycles with high Global Temperature rise as have been observed during our present Interglacial period and the MIS 5, 130 ka and MIS 9, 330 ka Interglacial cycles. This cold water flooding is believed to interrupt the Thermohaline North Atlantic Ocean circulation, reducing the transport of thermal energy to the Northern latitudes and causing abrupt cold spells such as the Younger Dryas and 8.2 ka Events. Again showing fragility of Earth’s climate. ● In Figure 84 examining the Eastern US Atlantic Ocean present shore line and the continental shelf shore line that existed during the ice ages, it is conclusive that the Thermohaline Conveyor Belt was inoperative or drastically slowed during the past ice ages (thus inducing the ice ages). This is because Coriolis force erosion seems to have only occurred during interglacial periods from the Gulf Stream Northward currents on the present shore lines. ● We show evidence that Younger Dryas type glacial cold water flooding occurred at the beginning of the Interglacial Plateau Regions of the Interglacial cycles MIS 5, 130 ka and MIS 9, 330 ka. This is premised due to the high Interglacial Plateau Period temperatures shown in Figures 60 and 61 and the shape of their Interglacial Plateau’s in Figure 61. ● Earth’s variation in carbon dioxide concentration appears to vary independent of Global Surface Air Temperature during quasi-equilibrium periods such as during the Interglacial Plateaus (see Figure 70). ● During the Glacial-to-Interglacial-back to-Glacial cycles, the large increases in CO2 levels during the Terminus Rise Region are driven by the increasing Global Temperature primarily from rise in Sea Surface and Earth Soil Temperatures and the resulting increase in CO2 aspiration to the atmosphere. A lag time on the order of 1000 years is reported to occur from the observed lag times in Sea Surface Temperature and Earth Soil warming. The main source of the CO2 is the large reservoir in the ocean (shown in Table II), since CO2 solubility decreases with increasing temperature. ● During the Interglacial Plateau Region of the cycle, the Global CO2 concentration continues to increase due to this homeostatic lag effect of Sea Surface Temperature warming. This can be seen in Figures 60 and 61. ● There are very large variations in the slope and duration of the Interglacial Plateau Region of the temperature and CO2 cycles. For the temperature, which is believed to be directly driven by the extraterrestrial forcing mechanisms by Solar Irradiance variation, this must mean that there are harmonic resonances and dampening’s with the astronomical forcing cycles and one single forcing mechanisms is not always dominant, otherwise the cycle Plateaus duration and slopes would be more consistent if it were. ● In comparing the Plateaus of past cycles in Figure 62, the 430,000 year BP cycle provides significant similarity to Earths present interglacial cycle Terminus Rise and Interglacial Plateau Regions without considering any astronomical forcing theories. This has been observed and studied by others (Rohling et al 2010, Raymo and Mitrovica 2012, McManus et al 2002). No other past cycle offers any reasonable resemblance. Using Covariance analysis methods, we show in Figure 85 that the 430 ka BP interglacial and our present Holocene period are strongly correlated. From this analogy, we estimate that the current cycles Interglacial Plateau may last at least another 7,500 years. Based on prior, most recent Interglacial cycles, we should expect a 2.5-3.5 ºC increase over 1950-1980 temperatures, the melting of most of the Greenland ice sheet and the Arctic Ocean ice cap seasonally and a global sea level rise of about 10 to 20 meters. This is irrespective of any CO2 greenhouse effects, which are expected to be relatively small during this extended interglacial Plateau period. ● Based on modeling of CO2 effects on Global Temperature and the data of Pagani et al (2005) of Earth CO2 concentrations and Earth temperature over a CO2 range from 360 to 1800 ppmv, we estimate a Global Warming coefficient of 0.09 ºC rise per CO2 100 ppmv increase and a temperature increase rate of 0.342 ºC per doubling of present CO2 concentration. ● Some concern is expressed that fully melted Greenland and Weat Antarctic Ice Sheets may induce a premature ice age (“hosing”). Recent data show that they were most likely melted during the 430 ka BP Interglacial Period (Raymo and Mitrovica 2012) and should not induce an ice age in our present Interglacial. ● On August 3, 2015, President Obama signed a regulation for his Clean Power Plan requiring States to reduce pollution from electrical generation by 32% by the year 2030, with the premise that Carbon emissions will cause irreversible damage to our climate. This again ignores the fact that Pagani’s work shows Earth Thrived with CO2 airborne concentrations as high as 2,000 ppmv . . In Leonard and Lucas (2015), we showed a correlation between the EPICA ice core data (Jouzel et al 2007) for the interglacial periods MIS 5, at about 130 ka BP and MIS 9, at about 320 ka BP yielding a Covariance and Pearson’s Correlation Coefficient r = 0.9696. We show this in Figure 1 where the correlation was made with the MIS 5 range being from 131.425 ka BP to 116.033 ka and the MIS 9 range being from 336.425 ka BP to 321.033 ka BP. Figure 1 – Graphs for covariance and correlation coefficient calculations between MIS 5, 130 ka BP and MIS 9, 320 ka BP Interglacial periods. This provided a net year span of 15,392 years. The r= 0.9696 provides a nearly perfect correlation. Leonard and Lucas (2013) further examined the correlation between MIS 11, 430 ka BP and our MIS 1, Holocene interglacial periods, somewhat arbitrarily scaling them to the end of both’s Terminus region, this shown in Figure 89 oF Leonard and Lucas (2015) and also Figure 2 below. This was accomplished by setting MIS 1, Holocene at 0 years BP for scaling at 1950 AD the GISS Global Temperature data in Leonard and Lucas (2015) Figure 91. This was such that the 2012 AD data point was -62 years BP in Leonard and Lucas’s (2015) Figure 90. This correspondence was shown in Figure 65 of Leonard and Lucas (2015). The similarity that was found between MIS 11, 430 ka BP and our present MIS 1, Holocene interglacial periods was noted by others such as Berger and Loutre (2002) and Rohling et al (2010). We found a covariance and Pearson’s correlation coefficient, r = 0.7023, shown in Panel C of Figure 2 below and Figure 89 of Leonard and Lucas (2015). Figure 2 –Examination of the potential correlation between the Interglacial periods of MIS 11, 430 ka BP and MIS 1, Holocene periods. In Figure 2A, we see the clear correspondence between the two Interglacial cycles just as for MIS 5 and MIS 9 in Figure 1. Here the Terminus Periods are matched in Panel B. We show the same correspondence for the carbon dioxide concentrations in Panels D, E and F.
We have now further analyzed MIS 11 and MIS 1 Holocene interglacial’s and found that scaling the MIS 11 data with 411.600 ka BP to 0 years BP for our Holocene period (present 1950 AD) provides a much better r = 0.8478. We show the EPICA raw data as Figure 3A above for both Interglacials. In Figure 3B, we have accomplished what was not performed before, i.e. smoothed the each data point in the Holocene data over 200 years, this making it more compatible with the MIS 11 sparser data of about 200 year intervals. What is observed is a surprisingly clear matching of five of the MIS Holocene Intergalactic region peaks such that they coincide with five of the seven distinct peaks in the MIS 11 intergalactic in Figure 3B. We have numbered them in Figure 3B. We see that MIS 11, 430 ka BP clearly yields a distinct “hockey stick” behavior. Looking more carefully at an expanded, closer to present, EPICA data in Panel 3C in the time region, from 600 years BP to -300 years BP (2250 AD) range, In Figure 3C, we see that the MIS 11 sparse data from 400 years BP to 0 years BP is linear and, also, that a smoothed set for MIS 1, Holocene is also essentially linear from about 400 years BP to 0 years BP. Figure 3C – Investigation of the pre-1950 AD MIS I, Holocene period (Green) and comparison to the same MIS 11, 430 ka BP region (Black). Shown is a linearity for both with MIS 1, Holocene smoothed. To see how closely these two data coincide, we have subtracted 1.0 ˚C from the raw EPICA MIS 11 data in Figure 3C, which therefore shows extremely close linear correspondence. This implies that the temperature rise from about – 0.475 ˚C to – 0.03 ˚C during this Holocene period from 400 years to about 5 year BP (about 1945 AD) is from only solar forcing effects, with minimal influence from any anthropic sources. This further implies that until about 1950 AD humans had contributed minimal anthropic warming to Earth’s climate (see Figure 66 of Leonard and Lucas 2015 for anthropic CO2 output). To answer the question as to “how much mankind has contributed?”, we looked closely to the period after 1950 AD. This was accomplished in Figure 3D. Figure 3D – At 0 years BP (1950 AD) the smoothed Holocene (Black) and the scaled MIS 11, 430 ka BP (Green) diverge, showing that at about year 5 (1945 AD) anthropic GHG began to contribute to Global Warming. By subtracting the green astronomical forcing curve, we obtain in red the net anthropic 2012 AD forcing of about 0.5 *C. The astronomical forcing MIS 11 analogue which in Figure 3C is shown to begin the “Hockey Stick” forcing increase at about 450 years BP, has caused a Global increase in Surface Air Temperature of about 0.72 ˚C. In Figure 3C, the “Hockey Stick” temperature rise is then predicted to end at about -200 years BP (2150 AD) for a net rise of about 1.12 ˚C if the MIS 11 analogue is applicable. We show in green the MIS 11, 430 ka BP upper curve in black, we show the “normalized” MIS 11 (-1.0 ˚C scaled) in green, the smoothed Holocene net Surface Air Temperature in black and finally we show the greenhouse gases global warming in red by subtracting the estimated (scaled) MIS 11 assuming that the Holocene mimics the MIS 11 climate, which our covariance suggests and many other investigators have premised. 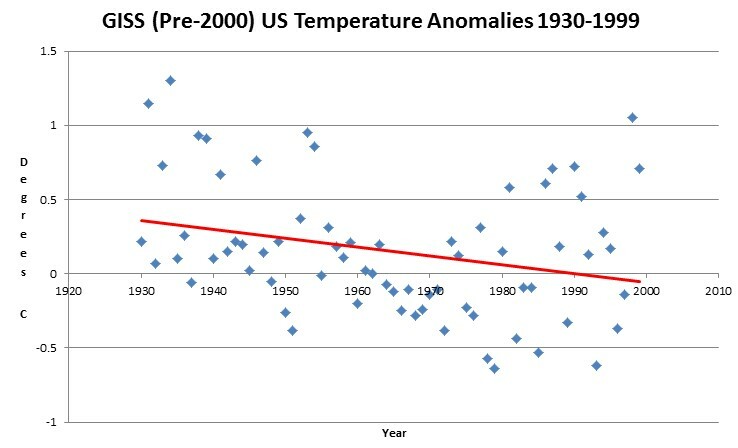 As Figure 4 we show the extent of the full “Hockey Stick” temperature effect for MIS 11. Figure 4 – The full MIS 11, 430 ka BP showing the global temperature increase from the “Hockey Stick” behavior centered at about 411,600 years BP. The EPICA data shows the transition from 412,042 to 411,402 years BP thus a period of about 640 years. The net rise in temperature is about 1.12 ˚C. From Figure 3D above, as of 2012, about 0.72 ˚C rise has already occurred. It is thus shown that anthropic influences have only, as of 2012 AD, had about a 0.5 ˚C Global temperature effect on our Global Climate, the remainder being from natural solar insulation intensity forcing from astronomical influences. This conclusion is a result of the climate in MIS 11, 430 ka BP experiencing a “Hockey Stick” temperature behavior beginning about 411,600 ± 200 years BP, also, as did our Holocene. This hypothesis would be more conclusive if more MIS 11 data points were available. The three scaled MIS 11 data points in Figure 3C producing the linearity, reinforces the hypothesis. We can also make some observations to support our MIS 11 “hockey stick” scenario with Figure 5 below. Figure 5 – EPICA Data From 430 ka BP to 400 ka BP Showing the MIS 11 Interglacial Period. Assuming similarity with MIS 1, Holocene and other Interglacial periods [shown in Figure 80 of Leonard and Lucas (2015)], we note a large reduction in temperature at about 425 ka BP most likely from a cold water breakout from an ice sheet such as Lake Agassiz in Canada [see Figures 78, 79 and 80 of Leonard and Lucas (2015)]. The “Hockey Stick” sharp rise in temperature at about 411 ka BP, at issue here, is appropriately noted as “hockey stick” and as well as the EPICA peak temperature of 3.15 ˚C at 407 ka BP as shown in Figure 62 of Leonard and Lucas (2015). Based on the replication of MIS 11 by MIS 1, Holocene, we can expect similar behavior for our interglacial [Berger and Loutre (2002)], dominated by extraterrestrial Milankovitch-like (solar) forces. The data supports that anthropogenic influences only became a factor about 1945 AD when global CO2 production was accelerated, as shown in Figure 66 (Leonard and Lucus 2015). Berger, A. and Loutre, MF, An Exceptionally Long Interglacial Ahead?, Science 297: 1287-1288, 2002. Jouzel, J. et al (31 others). EPICA dome C ice core 800KYr deuterium data and temperature estimates. Science, 317: 793-797, 2007. Leonard, BE and Lucas, AC. Indisputable Proof That CO2 Does Not Dominate Global Climate. Amazon 2015. Rohling, E. J. et al. Comparison between Holocene and Marine Isotope Stage-11 sea-level histories. Earth and Planetary Science Letters 291: 97-105, 2010. SORRY FIGURES DID NOT COME.